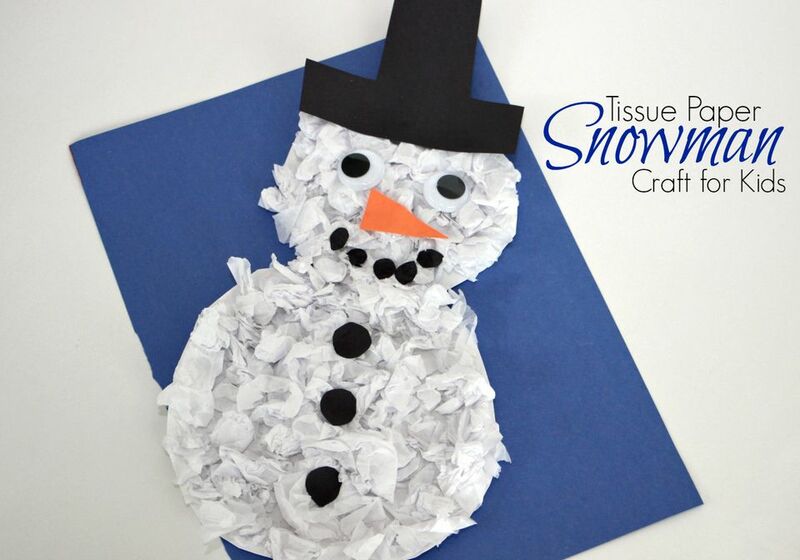 Let's make a fun snowman craft today! It's an easy tissue paper craft that kids can do with minimal help, and the result is super cute. A perfect winter themed craft for kids! Winter is on its way, and you can't explore winter with kids without doing some fun snowmen crafts. Grab some tissue paper, paper plates, and a few other simple supplies that are probably already in your craft cabinet and you are ready to go. Begin this snowman craft by cutting two circles from paper plates. Cut the center out of one. This will be your snowman's head. Next cut a slightly larger circle out of the second paper plate. Want a bigger body? Don't cut out the middle of the second paper plate, just the center of the first one to be the head. It's a great scissor skills activity for preschoolers, but younger children may need help with this part. Here comes the fun part! Using glue! Kids love to use glue, and this craft is a perfect craft for those that want to get busy gluing. First, you will need to glue the head onto your body. Next, set out strips or squares of tissue paper and have the kids rip and crumple them up into small snowball like pieces. Glue pieces onto the paper plate snowman until the whole thing is covered. This will give your snowman a snowy looking textured body. It's a lot of fine motor work for kids! Younger kids may benefit from using a paintbrush with the glue. They can squeeze a bunch of it in one spot and spread it out over the paper plate with a brush. It makes it easier for kids that struggle to squeeze glue bottles. Or try a glue stick! While your snowman is drying, you'll have time to cut out a hat, buttons, and circles. For your snowman's coal mouth use black construction paper. Cut a carrot nose from orange construction paper. And, get two googly eyes. Now's the time to glue on your snowman's eyes, mouth, nose, and hat. Don't forget the buttons! You can also use pom poms to create buttons on your snowman. Let the glue dry, and you are ready to show off your winter snowman craft! It's Frosty! Classic winter crafts like this help kids develop skills needed for writing by strengthening fine motor skills. And, they'll look so cute displayed throughout your house or classroom. Make some with your kids today!